If you’ve had it with getting stuck in a lukewarm shower at the end of a long day, you might be considering a tankless water heater as the solution to your water heater woes. If you’ve got a bit of money to invest in your plumbing and your not afraid of a few electrical modifications, a tankless water heater can definitely be a great investment in your home, with the added benefit of increased storage space and reduced electrical costs over the long run. The lure of having endless hot water on demand—not to mention your closet space back, if that happens to be where you keep your tank variety—is fast becoming an attractive alternative for many homeowners. 1. Tankless water heaters provide a fantastic ROI and cost-savings. The U.S. Department of Energy notes that gas-fired tankless water heaters can save consumers around $108 per year over traditional water heaters, while electric tankless heaters can provide a savings of about $44 per year. In many states, homes that install a gas-powered tankless water heater can claim a $300 federal tax credit. 2. Endless hot showers are part of the package. With water that runs on-demand through a heat exchanger that only turns on when you need it, you’ll never have to freeze through another cold shower again. And, you can do your laundry and run the dishwasher at the same time. If you have a big family, this type of hot water supply is almost a necessity. 3. Extra storage space is part of the deal. Storage tank water heaters take up a lot of space that most homeowners are happy to put to better use. 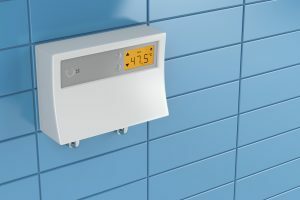 The compact size of a tankless—along with its typical installation in a non-descript location—can really improve the storage availability in your home. Not only does the huge tank disappear, but you can now make use of the additional space around it—which is usually off-limits as a fire hazard when dealing with storage next to a traditional water heater. 4. Tankless water heaters also typically have a longer warranty. The warranty is on a tankless water heater is usually 15 years. Most traditional water heaters come up short, with an average 3 to 6-year warranty. 1. Initial costs are higher than a traditional storage tank variety. Tankless water heaters do save money over the long haul, but the initial investment is a bit higher. With a tankless, you can expect to spend about three times what you’d spend on a tank variety. Costs to install a tankless typically average around $3000 for a gas-powered model, including installation by a qualified plumber. Electric models can be less, at around $1000—not including electric system modification costs. 2. Your home might need modifications to accommodate a tankless water heater. Not all homes come equipped to integrate a tankless water heater into the plumbing system. For homeowners with electric utilities only, the electric system may need to be modified to accommodate a tankless variety. Rewiring a house can easily add around $5,000 to the cost of plumbing in a tankless water heater.